Disclaimer: Sharky’s provided me with a voucher to try their new location. I was not compensated for this post and I was not required to write a positive review. All opinions are my own. When it comes to eating out I tend to stick to local spots in Portland. I love to support local businesses, the ability to know where my food is coming from and unless we are traveling I don’t spend a ton of time in the ‘burbs. However there is the occasional time I cross the river and head out of Portland and when I do I need a go to spot to eat. 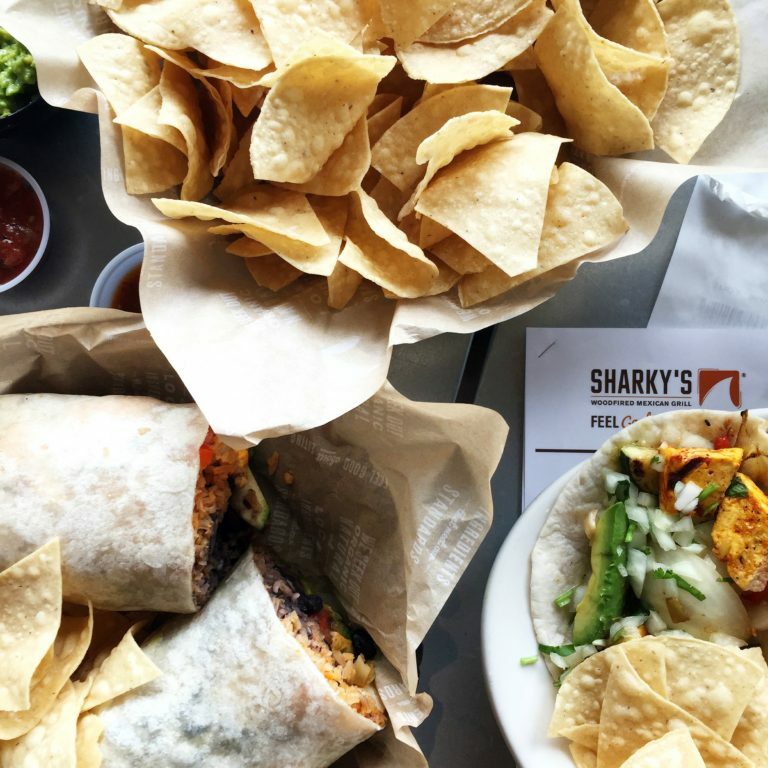 I feel like I have been searching for places that not only have great plant-based options but also quality of food and finally I have another great spot to add to my list – Sharky’s Woodfired Mexican Grill. 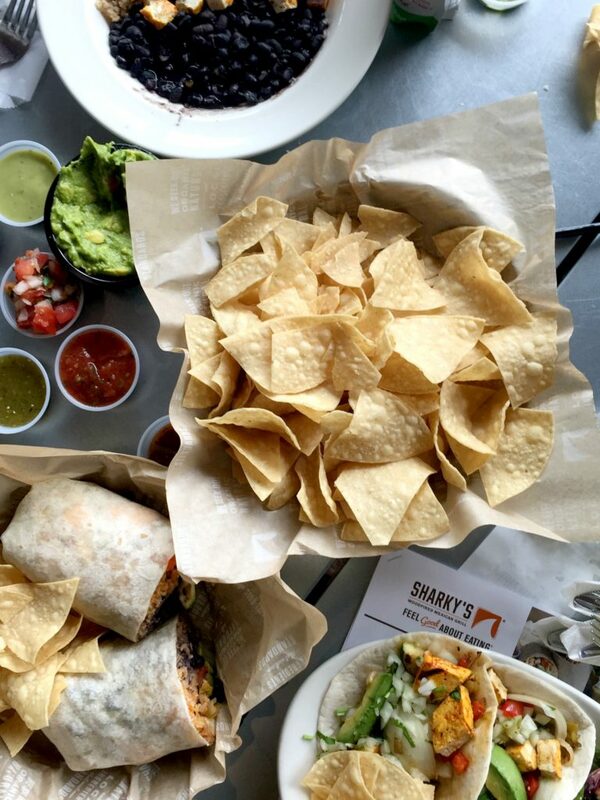 Sharky’s does their best to source organic, natural and local ingredients and they have so many plant-based options! Before heading in to give them a try I did a little research regarding plant-based options and they actually do a pretty great job of labeling items on their menu. I also found that The Veganista Foodie had put together a pretty great cheat sheet as well – which I of course used. We started out with chips and guacamole and of course took advantage of the salsa bar and tired just about every salsa available. 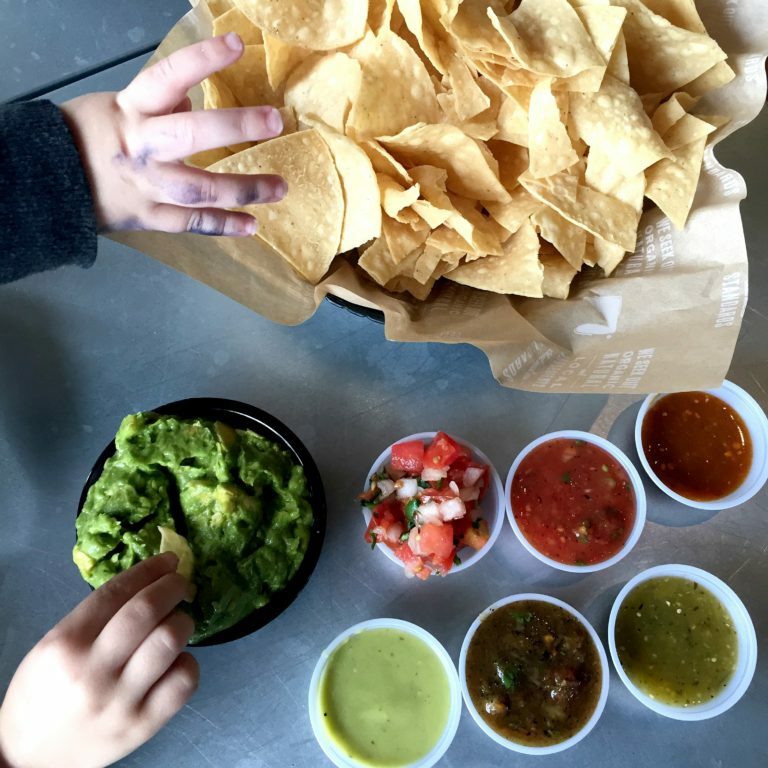 I could have eaten a bowl of the guacamole and those chips – so good! While we waited for our meals the kids also munched on their mini churros which were okay but a bit too crunchy for their liking. For meals the kids shared a kid’s bowl with organic tofu, organic brown rice and organic beans and a kid’s power plate with organic tofu, organic brown rice and organic yams. The went nuts for the tofu and while they weren’t so much into the yams Neil and I thought they were fantastic. In order to waste not I took the yams home and added them to a vegan mac and cheese and of course the kids gobbled it up. As for the adults we shared the organic tofu and veggie burrito and an organic tofu and veggie taco plate. 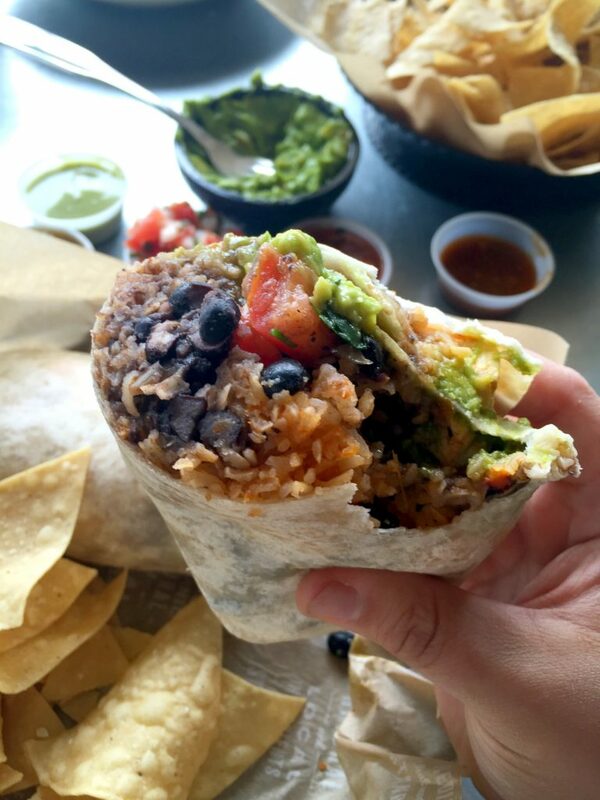 The burrito was massive and we could have easily just shared it because it was so much food. The veggie taco plate was delicious as well; we both loved the tofu and the veggies were cooked perfectly. Overall we were super impressed. We don’t head to Tualatin very often but I have to say Sharky’s might just have me visiting a bit more often. Our trip also took us to a spot we had never visited before and we ended up visiting a nice New Season’s and discovered the Tualatin ArtWalk. So mini trips to the ‘burbs are proving to be a bit more delightful. 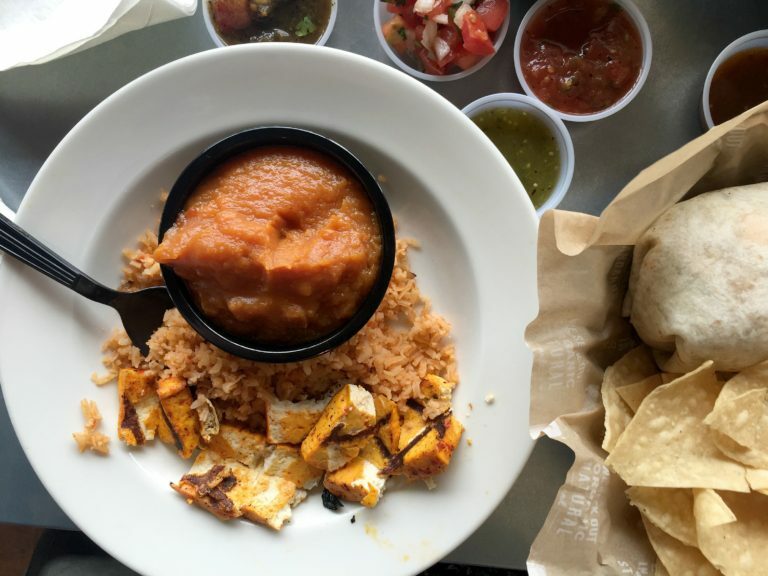 What are your favorite restaurants in the ‘burbs? Have you ever been to Sharky’s? If yes, any favorites? I can tell you ten years ago I would have never been writing this post. Ten years ago the only vegan cheese on the market was vegan cream cheese and some pretty terrible sliced cheese that was essentially processed cheese slices sans dairy. 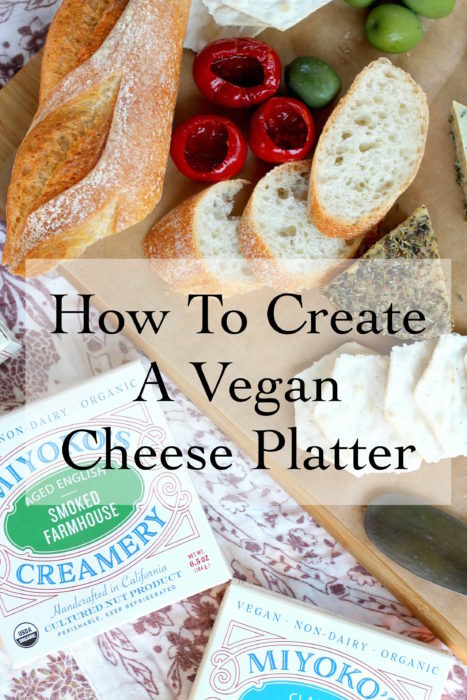 There was no way you could have got me to eat vegan cheese and I certainly wouldn’t be telling you how to put together a great cheese platter. Times have changed though and there are a number of really amazing artisan vegan cheeses out on the market. 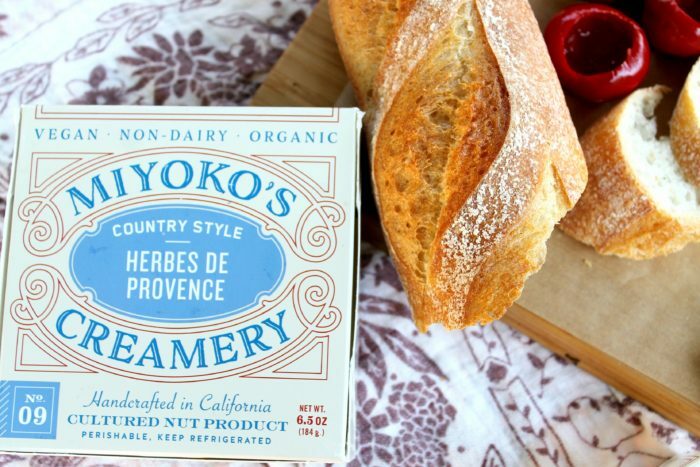 Currently my favorite brand for the vegan artisan cheese is Miyoko’s. Miyoko’s Kitchen has create a line of incredible vegan artisan cultured cheeses that have cashews as their base. The flavors range from your mild mozzarella which is perfect for melting on pizza to the tangy Black Ash (one of my favorites). I am also over the moon about Miyoko’s Classic Double Cream Chive which is slightly tangy while also being rich and creamy. Let’s be real they are all pretty delicious. 3-4 Amazing Vegan Cheeses. Look for cheese that compliment each other while also providing a variety of flavors and textures. For the platter I went with the Double Cream Chive (soft, creamy and mild), Aged English Smoked Farmhouse (a bit firmer, a bold sharp flavor) and Country Style Herbs de Provence (mild, tangy and a bit sweet from the lavender). Bread and/or Crackers. You need a vehicle to transport that amazing cheese to your mouth. I like to go with baguette and a mild cracker such as water crackers. Antipasto. I like to add some items from the antipasto bar. In this case sweet peppadew peppers and a few types of olives but you can go with whatever you like. Fruit. I love pears, both red and green apples and grapes. On this day I had some black cherries which were also nice. Spreading Knife. If you have a little cheese knife that would be great. In my case I have a few spreaders that work wonderfully. A great wooden board. There is something about a really great wooden board when it comes to a cheese platter. If you don’t have one a big white platter would work as well. Wine. Completely optional but I think a really great wine pairs well with these cheeses. If you don’t drink alcohol try a nice mild kombucha. What are your cheese platter essentials? 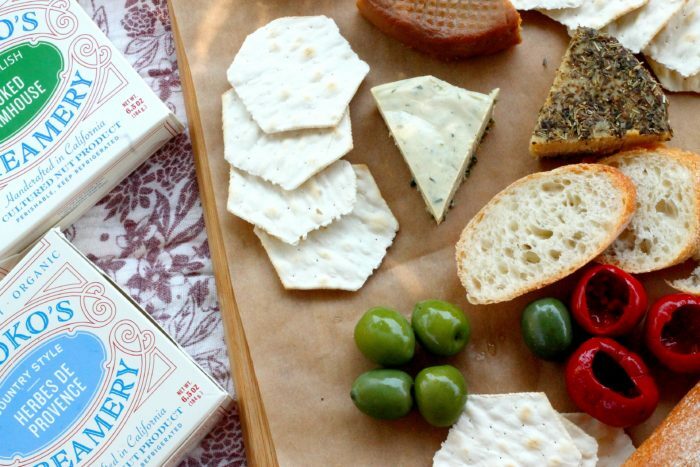 Have you tried Miyoko’s Cheeses? Do you have a favorite? Disclaimer: Miyoko’s provided me with a few cheeses to sample. Well we ate them all up before I had a chance to photograph them so of course I went out and bought more so my fridge is now fully stocked. I received no compensation for this post. 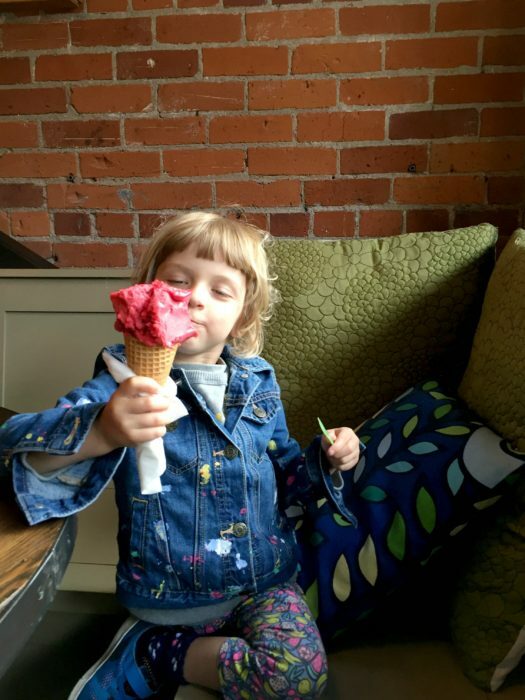 A few weeks ago we made our second big trip down to Bend, Oregon for some camping, hiking and gelato eating. 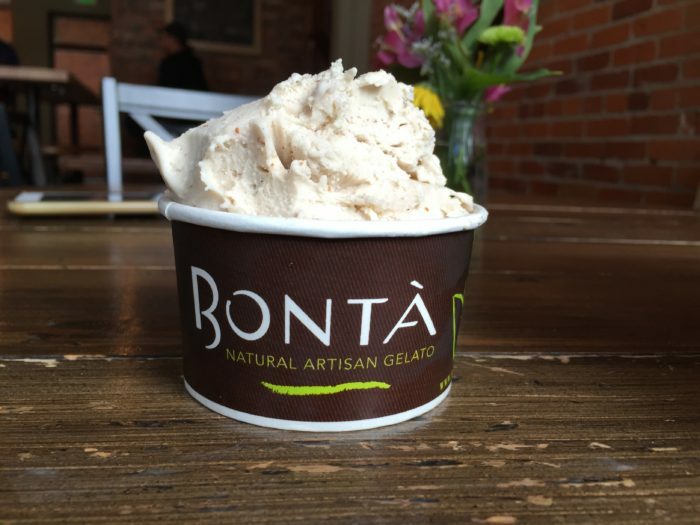 Prior to our trip I looked up ice cream shops to visit and Bontà was one of the first spots to pop up. 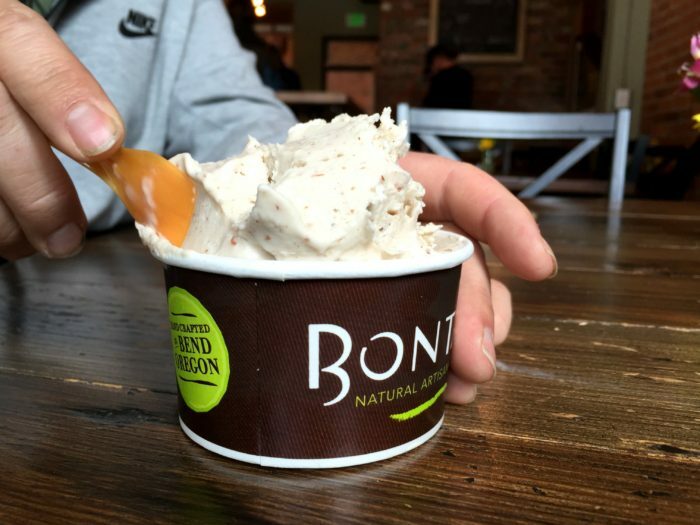 I checked to see what they had for non-dairy options and when I saw flavors such as chocolate coconut, lemon sorbetto, and vegan spiced latte I knew that we just had to give Bontà a try. Our first day in Bend we headed downtown and to our delight we not only found the Bontà store front but their was a food festival also going on which included the Bontà gelato cart. After perusing the flavors we decided to get the coconut with Jem nutbutter from the cart and the raspberry sorbetto from the shop. We also sampled the chocolate and the lemon which where absolutely amazing and I have dreams about going back for a scoop of each. The dairy-free gelato was smooth, creamy, and incredibly rich. Exactly what I love in a gelato or non-dairy ice cream. I will say we went for a regular size of the coconut with Jem and it was more than we could finish because it was so rich but oh it was so good. Overall A+++ when it comes to quality, selection and taste and easily one of my most favorite #FridayFoodFinds. Disclaimer: this post is in NOT sponsored. Disclaimer: GreenChef sent me my first box free. I’ve become accustom to having everything delivered straight to my from door. My groceries, my toilet paper, my takeout and now my meals all measured and prepared. Now I know meal subscription boxes are not new but when it comes to a plant-based box there are very few options but I found one that I LOVE. GreenChef is not a new meal subscription box but their plant-based box is only a few months old and let me tell you they are rocking it. The two person box comes with three meals with all the ingredients portioned out and ready for you to prepare. Basically they cut your meal prep and cook time in half and provide you with some really fun and tasty meals. As you can see above GreenChef labels all of your ingredients to make things super easy for you. I love that these sauces are made by GreenChef and packaged up and ready to go. I also love the use of products such as the tofu and noodles that I would normally purchase myself. They also do a great job at not only providing your with organic ingredients but also go as far as to use recycled plant fiber to insulate the package. I know what you really want to know is but how was it to prepare? How did it taste? Well it was incredibly easy to prepare! The directions were clear and easy to follow and the dish turned out just as it was supposed to. It also tasted amazing! It tasted like something I would have purchased out a restaurant but I made it!! The sauces were amazing, the recipe made more than enough food for two people and it was so tasty. You can check out the recipe for yourself here and you can also recreate it at home! We also had a really delicious tempeh dish with quinoa and kale salad which I brought to a pot luck. Our third meal was a minestrone soup which tasted fine but I’ll be honest it really fell flat for me especially after the first two dishes were so delicious. I have to say loving two out of three meals is pretty good. So would I purchase this? YES! I actually have plans to purchase my next box very soon. I should say that’s one of the features I like about GreenChef you can skip weeks based on the menu of the week or if you are out of town, ect. So you can use it every week or just when you feel like it. If you’d like to give it a try you can get 4 free meals via this link. Have you tried a meal subscription box before? What has your experience been? I absolutely love a nice glass of wine and if you pair that with vegan eats I’ll likely be your best friend. So, when I was invited to TeSóAria for their vegan brunch I just couldn’t say no. 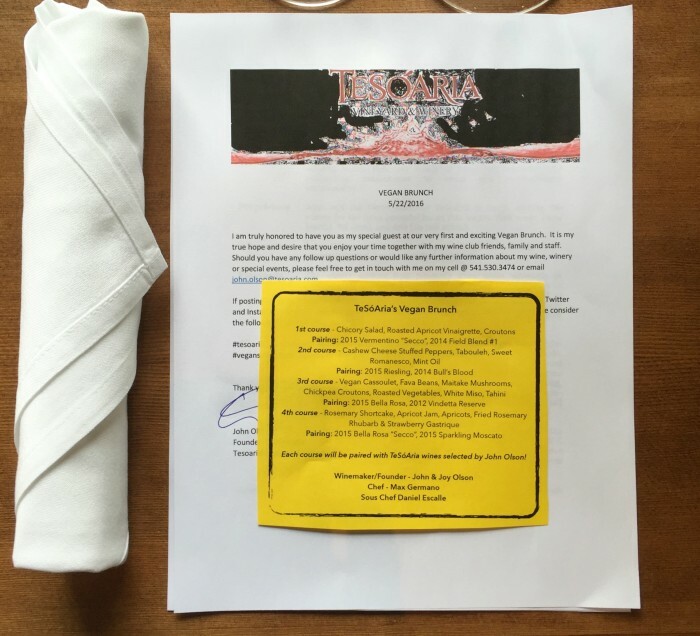 I didn’t know anything about TeSóAria before my visit besides that they have a tasting room in North Portland and the vineyard is in Roseburg. I arrived at the tasting room and was instantly impressed by the space. It’s bright and inviting and has these big beautiful windows that let in so much light and open during the summer. Can’t you just picture it sitting either at one of their outside tables or inside with the windows open and a nice glass of wine? Okay, so basically I am planning Neil and my next date night. Anyways I found my seat and took a look at the menu which feature four courses with two wine pairings for each course. We settled in with a bit of wine to start and of course I can’t remember what it was but it was white, crisp, slightly sweet and a great way to start the brunch. Once everyone had arrived it was (finally) time to start eating and drinking! Founder and Winemaker, John Olson, started us off with a nice welcome and then got right into explaining the wines he had chosen for our first course. Since I know very little about wine, basically I know what I like when I taste it, it was nice to hear the back story of each wine and John did an amazing job of making it fun and interesting while also informative. John explained each pour of wine at the start of each course and I felt like I left knowing so much more about wine. Now we will get into the food because let’s be honest I might not be a wine connoisseur but I do know vegan food. Then it was time for our first course which was this beautiful salad. I have to say I was a bit skeptical because I’m just not one of those people who likes fruit in my salad but the roasted apricot vinaigrette was actually pretty amazing. My only gripe with this dish is that it was a bit over dressed but if it had about half of the vinaigrette on it (or twice the greens) I would definitely order this again because it tasted amazing. 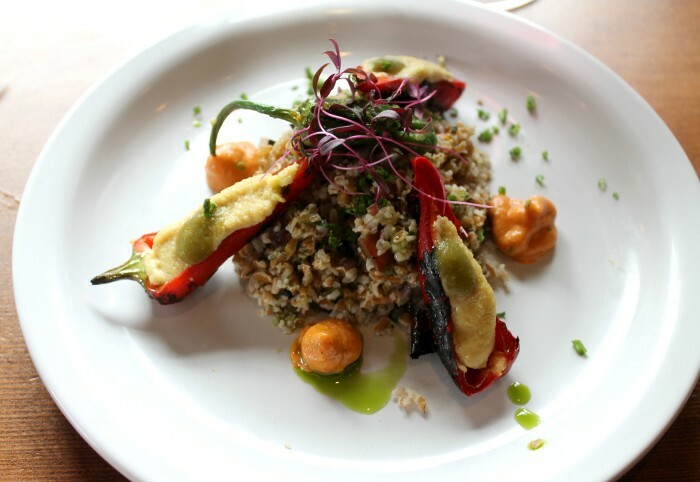 Next up we have this beautiful dish that features peppers stuffed with cashew cheese and a tabbouleh. I know you’re thinking cashew cheese?!? Yes it was as good as it sounds. This dish was easily one of the top favorites at our table and I have to agree. 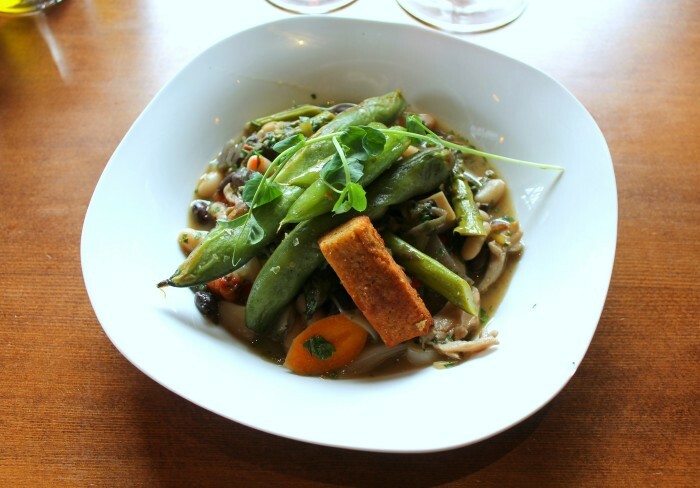 Our last savory dish was a cassoulet featuring a variety of beans and mushrooms, grilled fava beans and a chickpea crouton. I thought that the flavor of this dish was spot on but it honestly was my least favorite (but still incredibly flavorful and delicious) of everything we ate. I love the beans and mushrooms but I’m not big on fava beans that are still in the pod, they have a bit of a strange mouth feel and are a bit tough to eat. The chickpea crouton was good but I think with all that beautiful broth hanging out at the bottom of my bowl I would have loved a bigger crouton to sop it all up or a nice piece of bread. 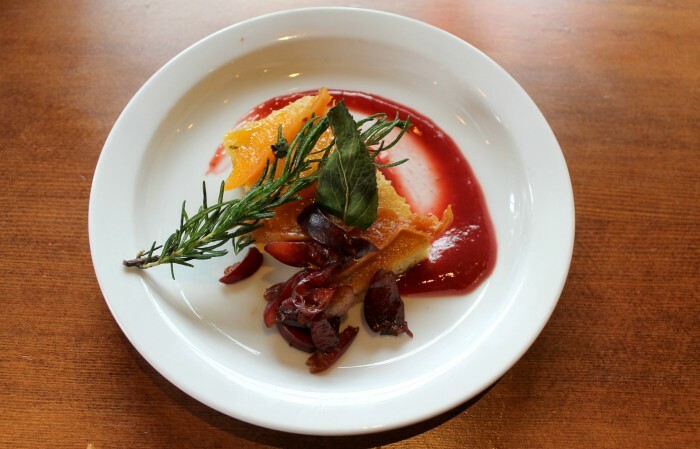 The last course we had was this incredible rosemary shortcake. I could have eaten five plates (or more) of this because it was just amazing. It was sweet and savory and a little bit tart. I just couldn’t get enough and if I had been at home I would have licked the plate. Overall I had an amazing experience and I hope they host this event again because I would love to do it again. The food was really great and the wine was incredible. 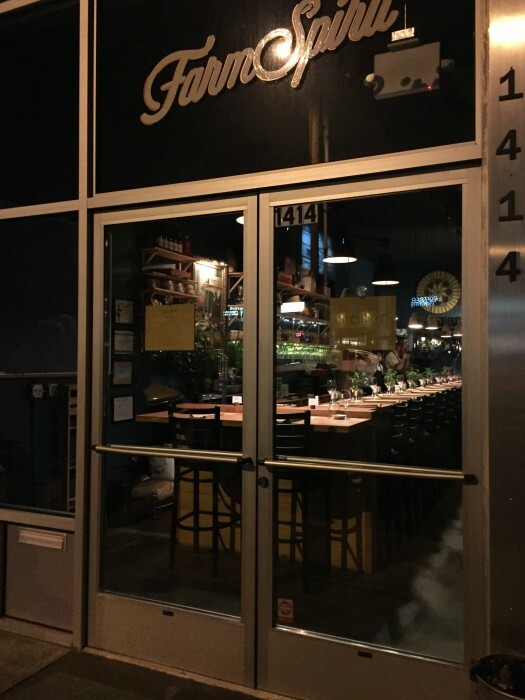 It isn’t often that you find an amazing wine bar that also has really delicious and fun vegan options. I also am looking forward to trying TeSóAria’s Vegan Thursdays, called “Shut Up and Eat Your Vegetables!” starting this coming Thursday, June 16th from 5pm on at The Portland Tasting Room. Every Thursday, Chef Max will have a Seasonal Vegan Tapas Menu available to pair with our award winning Wines! Vegan Tapenade, Mezze Boards, Samosa’s, and more, priced $4 to $12. Available every Thursday starting at 5pm. What is your favorite wine? Which of the four courses do you think you would enjoy the most? Check out these other bloggers thoughts on this wonderful brunch! This is not a sponsored post. I received no compensation. I have been testing out natural deodorants for years now and have found very few that work for me, whether it’s a matter of staying fresh all day or a scent that I like enough to repurchase. I feel like every month I am either testing out a new natural deodorant or I am simply going au naturale. Until now because I have finally found a deodorant that I want to buy in bulk. Ursa Major is a Vermont based company who is creating amazing natural skincare products that are free of nasty chemicals. Their products are 98-100% natural, they use organic ingredients when possible and their products are gluten free and cruelty free. They also make the best natural deodorant I have ever tried. 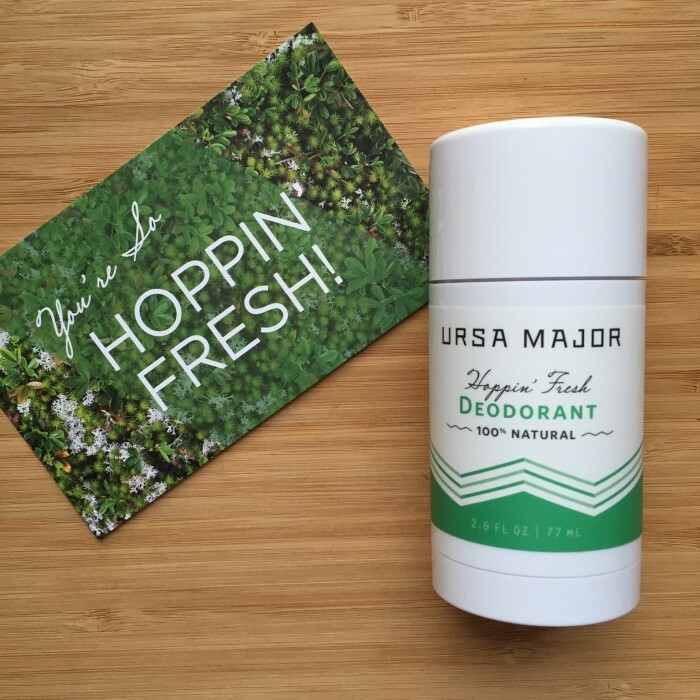 Ursa Major’s Hoppin’ Fresh is pretty new to the natural deodorant scene. It’s honestly the first natural deodorant that I get really excited to wear because I know it’s going to work. It even claims 24-hour protection and let me tell you, I believe it. I have worn this all day including a gym workout and it has left me feeling (and smelling) fresh without having to reapply. The deodorant is filled with ingredients including eucalyptus, hops and kaolin clay that help to protect against odor causing bacteria. A bit of aloe is added to help sooth sensitive skin as well and I personally think it helps counteract the baking soda because I haven’t found the urge to itch my pits at all and often natural deodorants with baking soda have me scratching all day. Now the scent is the only thing that I think might be a little more of a hit or miss for people. I personally really love the fresh, herby smell of eucalyptus, ginger, rosemary, grapefruit, chamomile and lemon but and I find that it doesn’t stick around or negatively interact with other scents that I might choose to wear. However I would love to see Ursa Major come out with more scents that work just as well as their Hoppin’ Fresh Natural Deodorant. Overall I’m over the moon and I just can’t stop talking about this deodorant to friends, family and other gym goers. I am thrilled to finally find an amazing natural deodorant to share with you. My natural deodorant investigation isn’t over yet because I know there are still a bunch I have never tried before but I can guarantee I’ll have a Hoppin’ Fresh on hand at all times. Do you use natural deodorant? Why or why not? What is your favorite natural deodorant? *I occasionally receive products for sample. I am choosing to share this product with you because I truly love it. Date nights have become a regular occurrence for us lately because frankly they are incredibly important. However, most of our date nights are pretty casual and sometimes they even involve running a few child-free errands. But, our last date night was one that was far from a casual affair. It was free of phones (except to snap a few photos for you), errands and our beloved children. 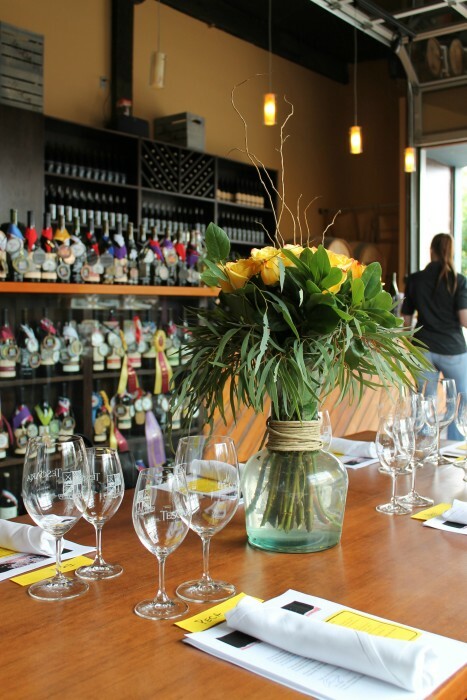 We were kindly invited to attend one of Farm Spirit‘s multiple course dinner seatings. 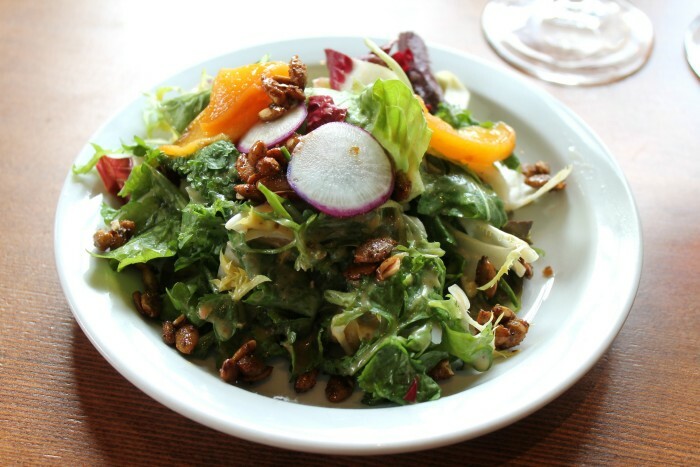 Farm Spirit is the brainchild of Chef Aaron Adams, formerly of Portland vegans’ favorite, Portobello Vegan Trattoria. 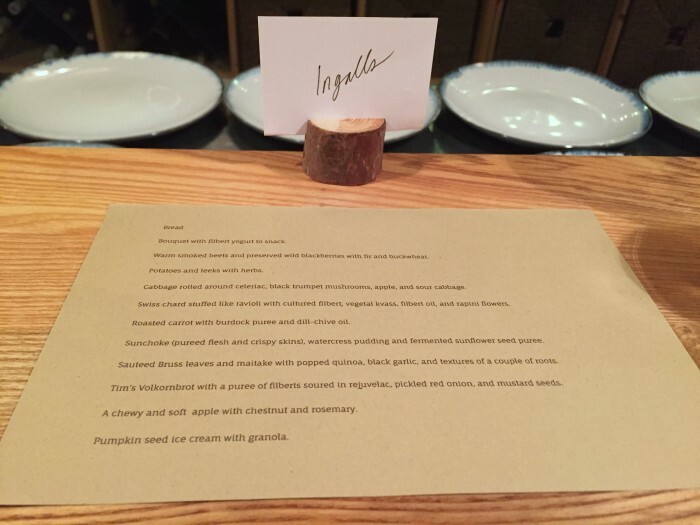 The restaurant focuses on thoughtful courses with the seasonal ingredients sourced almost entirely from the Cascadia region in the Pacific Northwest. 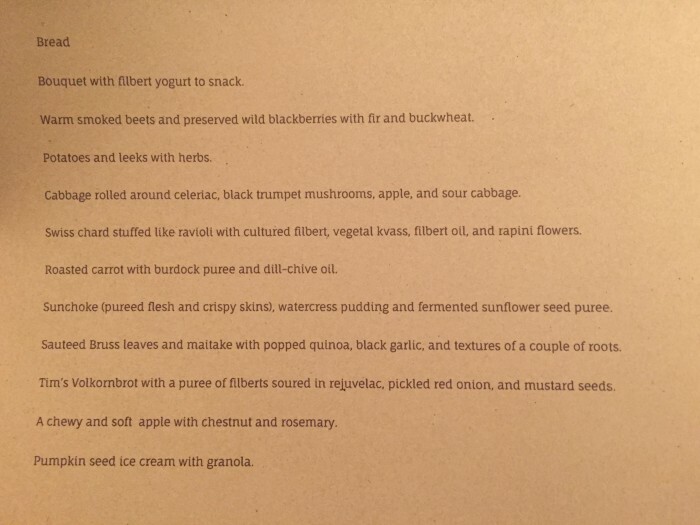 Adams clearly cares about supporting local farmers and artisans, going into great detail when describing the dishes and the origins of their ingredients. Even the dishware was created by local potter Steve Kelly. Tickets for the seatings are sold in advance and are in high demand. Each seating is limited to 14 and there is only one seating each night, Wednesday through Saturday at 7pm. *Update* Starting April 6th, Farm Spirit will offer multiple seating times throughout the evening, starting at 5:15 p.m. and going as late as 8:30 p.m. The seatings will be smaller allowing for more focus and attention to be on the guests. When you walk in each seat has a menu and a place card with your last name. The seating a is a bit unique in that all guests are seated at a communal bar and the chefs prepare and plate each one of your courses right there in front of you. You know immediately that this experience is more than just the food. Farm to table has become somewhat cliched lately but not at Farm Spirit. You come away with a great appreciation for and understanding of the ingredients, the farmers, and the process that has gone into making your meal. Above you see the 12-course menu starting with the most amazing bread and olive oil and ending with an incredible pumpkin seed ice cream. 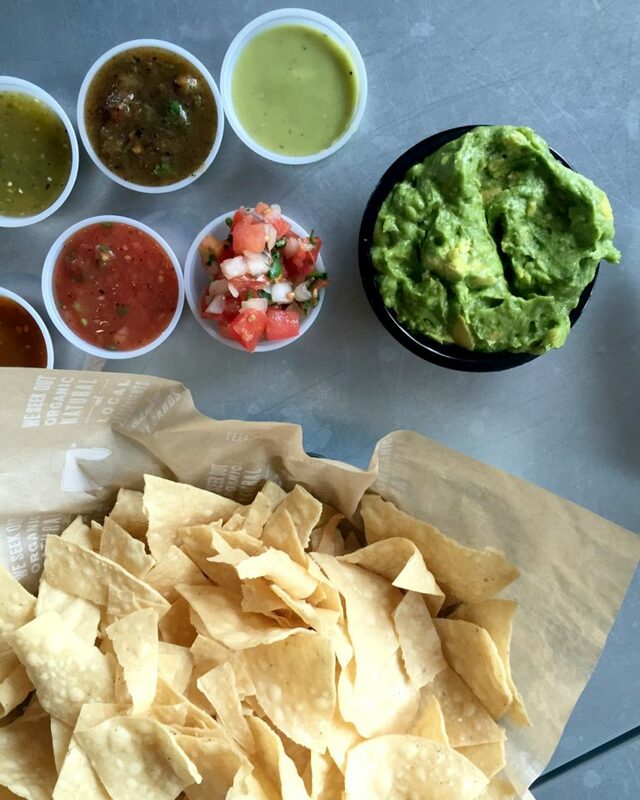 The real highlights are all the dishes in between. But, I’ll get to that in a bit. 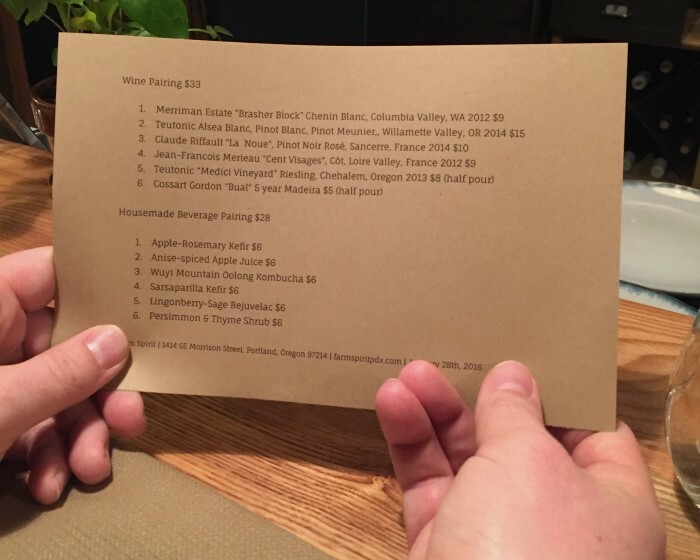 To go along with our meal we decided to share the wine pairing and the house-made (non-alcoholic) beverage pairing. All of the wines were wonderful. One of our favorites was the Madeira. Neil and I couldn’t get over how amazing it was and how well it paired with the last two courses. As for the house-made beverages you won’t be disappointed. They were all unique and had such a range of flavors all of which perfectly complimented their dishes. Neil has been really interested in wild fermentation lately and spent a great deal of time asking the chefs about the process that went into the drinks. 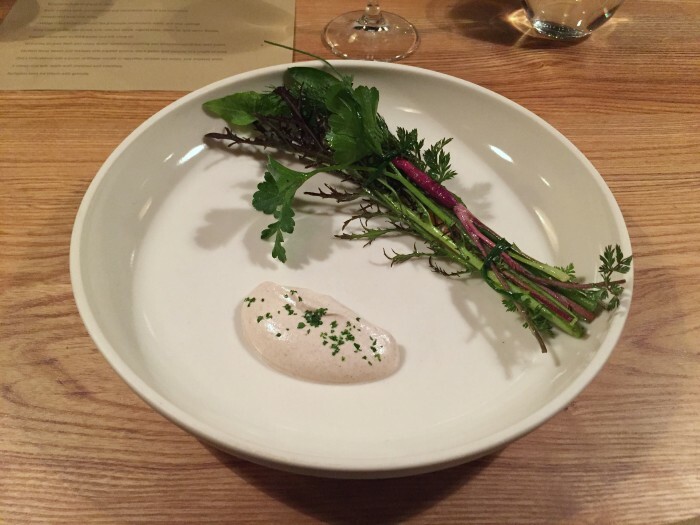 Our first dish was this bouquet of herbs and greens and a little purple carrot with the most incredible hazelnut yogurt. To eat we were instructed to use our hands, dip, our bunch and enjoy. How was it? While it almost seems a little awkward to eat at first, that dissipates quickly when you’re blown away by the variety of flavors and textures in the dish. 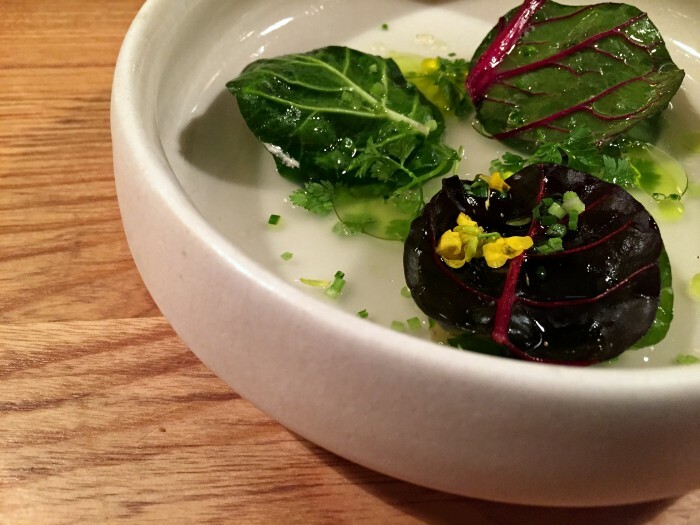 Another dish to highlight was the Swiss chard that was made to resemble ravioli. It was fresh, crisp and the vegetal kvass broth had me lifting the bowl to drink up every last drop. 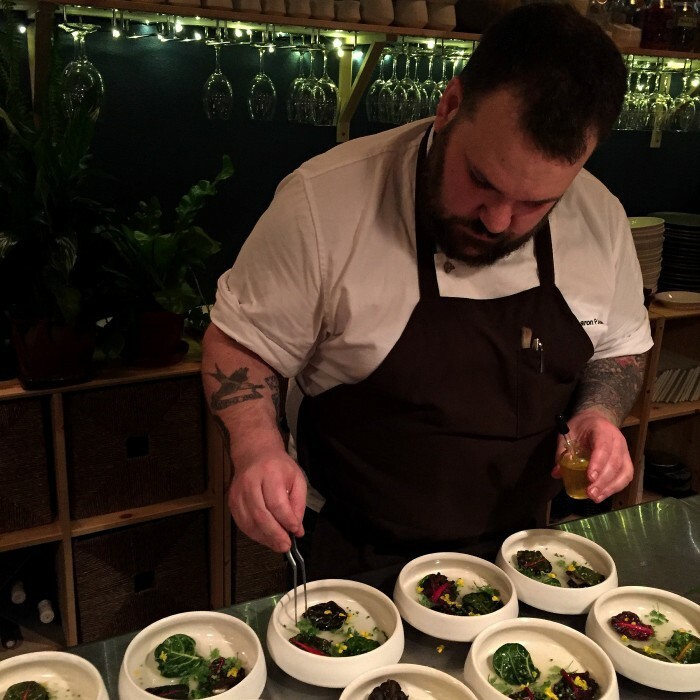 The chefs do a great job of introducing you to the dishes and reminding you to let go of your inhibitions about eating with your hands or drinking up the last of the broths in your dish. 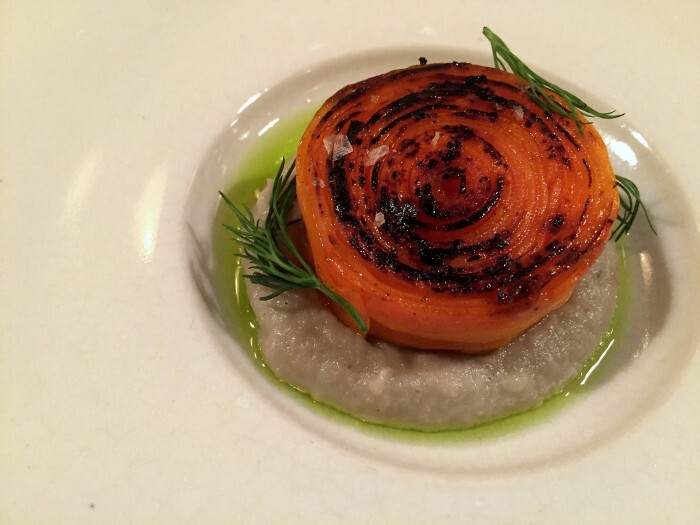 This next dish was another one of my favorites – the roasted carrot with burdock root puree. As a home cook, this was one of the less intimidating dishes. It’s one that I’m inspired go home and recreate, maybe not to the same caliber, but I could still do it. I have to say of all the dishes this last one is my favorite. Tim’s bread was the star of the night for me. 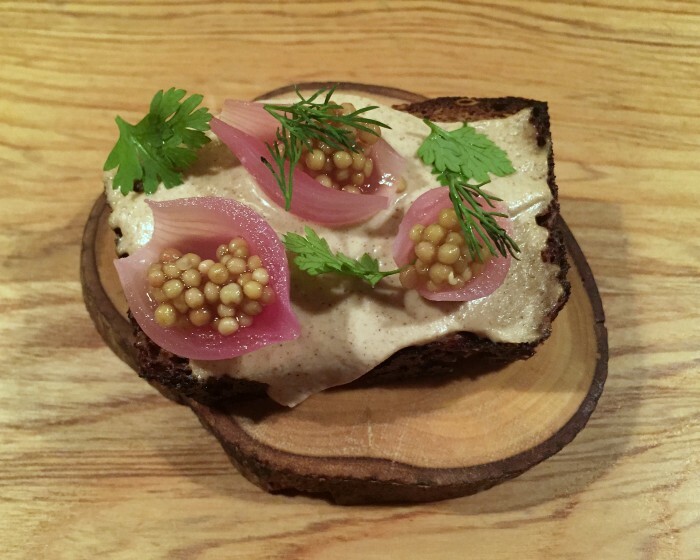 I could have easily eaten an entire loaf of the vollkornbort with the soured filbert puree and of those pickled onions and mustard seeds. As the evening wound down the dessert courses are presented and your hot beverage order is taken. The offerings include coffee from local roasters Cellar Door, tea from Steven Smith, and a house-made hot drink. Once everyone has cleared their plates the chefs give you a warm thank you and a sweet breakfast bread to take home to enjoy with your morning coffee or tea. Such a sweet and unexpected way to end a perfect dining experience. We enjoyed our meal and experience so much that immediately upon returning home that night we booked our next visit. One thing to note when you are purchasing your dinner tickets is that dinner is around three hours long. I know three hours sounds a bit daunting but honestly you won’t want the night to end. Have you tried Farm Spirit? What were your thoughts? If you are a local Portlander or are visiting Portland I recommend getting tickets right away you won’t be disappointed. Farm Spirit is located at 1414 SE Morrison, Portland, OR 97232. Find Farm Spirit on Facebook.com/FarmSpirit, and @FarmSpirit on Instagram and Twitter. *I apologize for the photo quality – while the food was amazing the lighting was far from ideal for photographs!